Well, read into this whatever you like, but as it happened the Whingers were both free. They had been invited to occupy the press room backstage at the 10th year of the awards and “interview the winners”. Mmmmm, interview. The Whingers discussed this opportunity, decided it sounded like quite a lot of work and opted instead to act as a couple of bookends for the winners’ photographs to add a touch of glamour to the proceedings (as if the evening wasn’t glamorous enough). It also meant they were presented with a list of the winners before the show even started. How they mingled with the nominees in the roped off VIP section of the elegant Delfont room in the beautiful Prince of Wales Theatre before the show began and managed to keep their traps shut is anyone’s guess. They guzzled the free Merlot, desperately trying to “pace themselves” but it was one of the hardest things they’ve ever done. Looking around the tightly packed area it was impossible not to be shoulder to shoulder with celebrity. “Shall we let them down gently so they can go home now?” mumbled Phil as the Whingers scanned the throng trying not to catch their eyes lest a sympathetic look might tip them the wink. Jason Donovan, Maureen Lipman, Roger Allam, Alison Steadman, Jane Horrocks and Lesley Garrett would all go home with out a perspex door stop in their handbag. 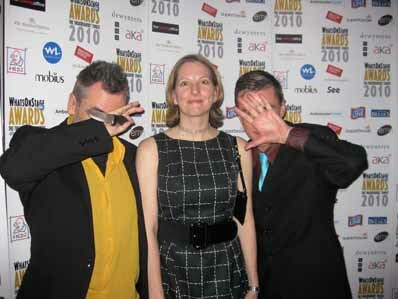 And it was some relief that the Whingers already knew they wouldn’t be the cause of a nasty scene in the press room had Horrocks or Garrett taken home a trophy after their less than flattering comments on their shows. Which in case you missed them are here and here. But the first award to Sir Trevor Nunn presented its own problems. Weren’t the Whingers once accused of closing his Gone With The Wind – The Musical!? 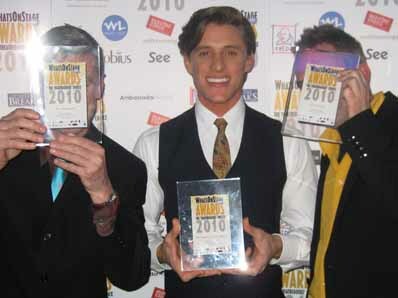 Andrew lurked in a shadow adamantly insisting “We’re NOT being photographed with him!” despite having been very positive about both A Little Night Music and his most recent theatrical flatulence Inherit the Wind – both shows leading to his award for this particular evening. But Andrew was insistent that once Sir Trev’s conversational floodgates were opened there would be no shutting them, which Simon the official WOS interviewer discovered the hard way as the Whingers sinckered into their free falafel wraps. The celebrities weren’t exactly flooding into the room: some of the big name winners weren’t available. Jude Law, Rachel Weiz and Rowan Atkinson at least must have had romantic dates for the night. 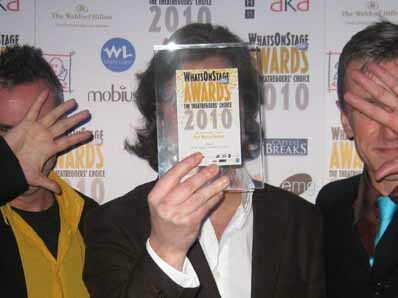 At one point it appeared as if star director-du-jour Rupert Goold was to be a no-show, the people behind Whatsonstage held the start of the whole event several minutes and then went ahead without him. Oliver Thornton scrubs up very well and Andrew was so excited that he had a little accident (spilling wine down his shirt actually) before getting into a row with Mr Thornton as to whether or not he had been “off” the night Andrew recently went to see Priscilla. Thankfully Phil managed to calm things down before Security were called in. The irrepressible Jodie Prenger clutched her trophy saying she felt like Vernon Kaye. Jodie – if you want him, he’s surely available. Phil even bothered to “interview” her about her plans after leaving Oliver! in March. Phil’s drunken scribbles in his newly purchased “Reporters Pad” (sic) resembled shorthand but it was something about radio, some telly and a new Glenn Miller album and possibly something in the West End later in the year. Patina Miller was so delightful the Whingers presumed she had no idea who they were (we having been less than flattering about Sister Act). And having been dragged away from them returned to apologise “I wasn’t trying to run away from you two”. Phil thought it only polite to quiz her about a Broadway run of Sister Act but she couldn’t confirm anything, “we’re hoping” was all she could offer. Like the adorable Patina, Loose Woman Lynda Bellingham proved most convivial considering the mauling we had given to Calendar Girls. 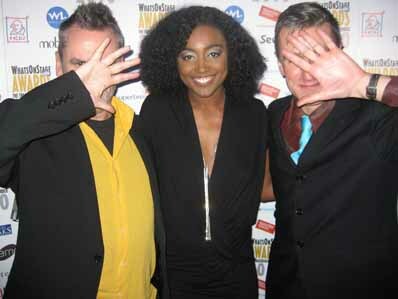 She even recognised the Whingers’ signature pose as they collared her with equally charming CG writer Tim Firth. Unlike the Whingers, celebrities clearly don’t bear grudges. Something we must teach them. Goold – who at least pretended he knows who the Whingers are – proved impossibly glamorous with his good looks and Melvyn Bragg coiffure that Whingers insisted he held the trophy in front of his face for the photoshoot which is actually a shame as he’s a very smiley man. 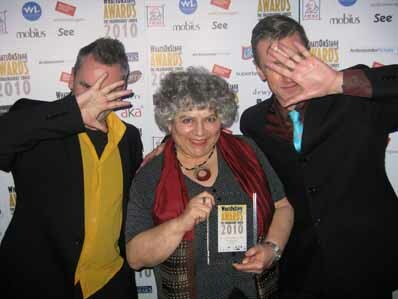 Miriam Margolyes who, disappointingly, wasn’t there with Valerie Singleton as Biggins had outrageously suggested at the start of the show, told the Whingers “You can have me on the floor if you want”. What could she possibly mean? And Phil again deciding he should do some proper “reporting” quizzed her on how she got into the dustbin for her award-winning turn in Endgame was told “Up a ladder”. Consider it an exclusive. Jez Butterworth, further to an impromptu meeting at the Jerusalem opening night party, confirmed he will be rewriting Jerusalem to include Phil’s home town Westbury for the Broadway transfer. Jez’ is under instructions from his mother too apparently. 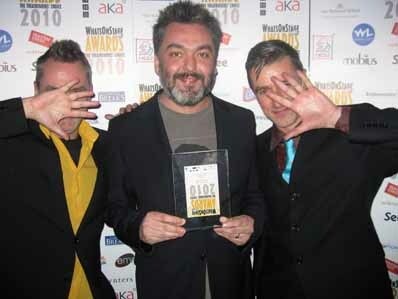 Phil ran off with Jez’s trophy, holding it hostage just to make sure, but mistakenly referred it as his Olivier. But then that’s a given that he’ll be receiving one of those too in due course. 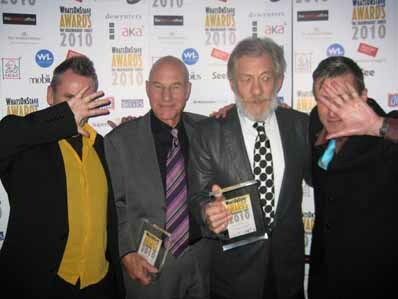 But real star power turned up in the shape of two X-Men, Sirs Patrick Stewart and Ian McKellen, Stewart received best supporting actor for Hamlet and the pair were there to pick up the rather bizarre AKA Theatre Event of the Year gong for their pairing in Waiting for Godot. McKellen pretended he had no idea who the Whingers were and proved rather grumpy, which we thought was a bit off given he was one of the few winners we’d actually raved about. But the two elder statesmen of the blogosphere held the two elder statesmen of theatre in a vice-like grip until the snapshot was done. Mind you, Sir Ian gave Phil a funny old look. Imagine what those four’s collective age is. Scary. The Whingers did sneek into the auditorium to watch some of the show, hosts Christopher Biggins and Mel Giedroyc were very funny opening the show pretending to be James Corden and Sheridan Smith (previous hosts, Smith having been slated as host until a few days ago). Biggins later appeared as Susan Boyle singing a rewritten “I Dreamed a Dream” and announced Jude Law as “an old shag of mine”. Giedroyc who scrubs up very well had her hair piled high in a look she described as “Princess Anne meets Myra Hindley”. So, all in all it was quite good fun. Why were we invited? 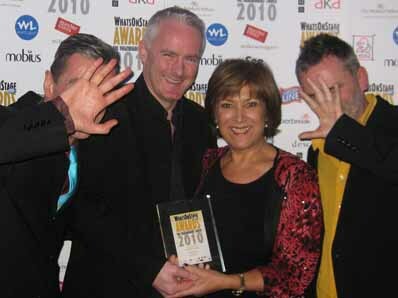 No idea, but WhatsOnStage.com editorial director Terri Paddock insisted on having her picture taken with the Whingers so the whole thing may have been one huge elaborate ploy. This entry was posted on	Monday 15 February 2010 at 2:32 pm	and is filed under West End Whingers. See now I’m just wondering what Roger Allam’s handbag would be like.. 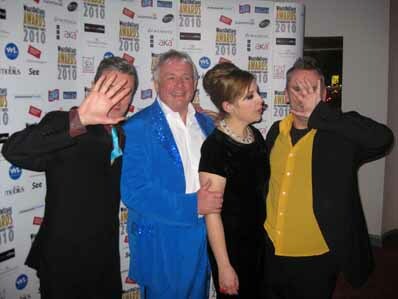 Awesome review – Biggins and Mel were much better than I’d been expecting and it was marvellous to see Sirs Patrick and Ian at the awards! It was a great night for us plebs to “mingle”, even if a little infra-dig for the celebs. At least they were the ones roped off in the sheep pen in the bar, and we had free reign! Thought Corden & Smith would be a hard act to follow – needn’t have worried – Mel & Biggins did an admirable job, hope they are free next year. I love the Pirates, but they know that already. Completely obsessed with their stunning harmonies! This business of covering your faces is just frankly…weird. Serena McKellogg is looking more and more like Danny Kaye. Are they by any chance related? ..but not as tiny as your thumb apparently. Was there anyone interesting from the world of opera there? You definitely have an impressive array of theatre star shots, althought you can never prove it was you! Why cover your faces? !